in 360i News with tags Awards, creative, technology Both comments and trackbacks are closed. Marvel’s Create Your Own Comic microsite recently picked up a Best in Class Award in the Entertainment category at the Interactive Media Awards (IMA) competition. The IMAs honor excellence in web design and development. The Best in Class Award is the highest honor granted by the IMAs, with winners representing “the very best in planning, execution and overall professionalism.” The Create Your Own Comic microsite earned 492 points out of a possible 500, making it eligible for inclusion in the IMA’s Top 10 Websites of the Year list. Marvel Entertainment partnered with 360i’s Creative & Technology group to create a fully interactive destination within the Marvel.com family, fostering creativity and imagination among kids and parents. 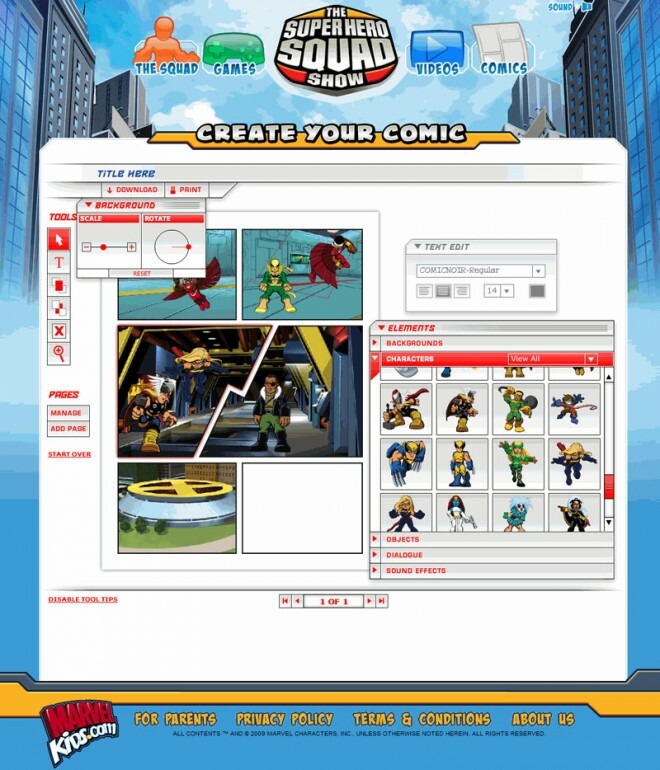 The action-packed microsite allows visitors to fully customize their own comic strip or book from start to finish, empowering them to create their own layout/design, choose backgrounds and settings – and even add fully editable characters from Marvel’s Superhero Squad. The Create Your Own Comic site won two Hive Awards (Best Gaming Entertainment Site & Best Web App) earlier this year. A similar microsite created by Marvel and 360i, Create Your Own Superhero, also received widespread praise – picking up a WebAward (Best Children’s Website) and a Webby nomination in 2009.